When the weekends come, I want to sleep in. There are those who see the weekend as an opportunity to get up early and hit those weekend projects first thing. I am not one of those people. I believe in lazy weekend brunches that start around 11:00 where you get to read the newspaper at a leisurely pace while sipping a perfectly brewed cup of English breakfast tea. I like to ease into my weekends. Unfortunately, the lazy weekend brunches have not been happening as often as I would like due to the many early morning swim meets my daughter has been attending this summer. So, when a free weekend comes around, I take full advantage. This frittata lets me put a fabulous brunch together with minimal effort. Since all the main ingredients (eggs, frozen hash brown potatoes, Boursin) are items I almost always keep in the refrigerator, I don’t have to do much planning either. If I happen to be out of scallions, I just omit them from the recipe. Smoked salmon goes very nicely on the side but also is not required. Serve the frittata with some fruit, if you prefer. 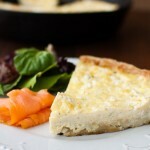 Or add a green salad and serve the frittata for an easy dinner. Seriously, Saturday can’t get here soon enough. Heat oil in a cast iron or ovenproof 9 to 10-inch heavy nonstick skillet over high heat. Add potatoes and scallions to oil, season with salt and stir until potatoes are evenly coated with oil. Spread mixture evenly over the bottom of the pan. Cover and cook for about 4 minutes. Stir potato mixture again, spread mixture evenly, then cover and cook 3 minutes more. Remove from heat. While potatoes are browning, whisk together eggs, salt, and pepper until just combined. Set aside until potatoes are done. Pour beaten eggs over potato mixture. Using a fork, scrape the top of the cheese with tines to evenly crumble cheese over eggs. Transfer skillet to oven and bake frittata, uncovered, until set and just cooked through, about 15 minutes. Serve immediately with slices of smoked salmon. Recipe from Gourmet Magazine, December 2005.